Sand in your shoes! Sit on the sandy beach in front of your own unit with nothing but sand and a breeze between you and the bay! 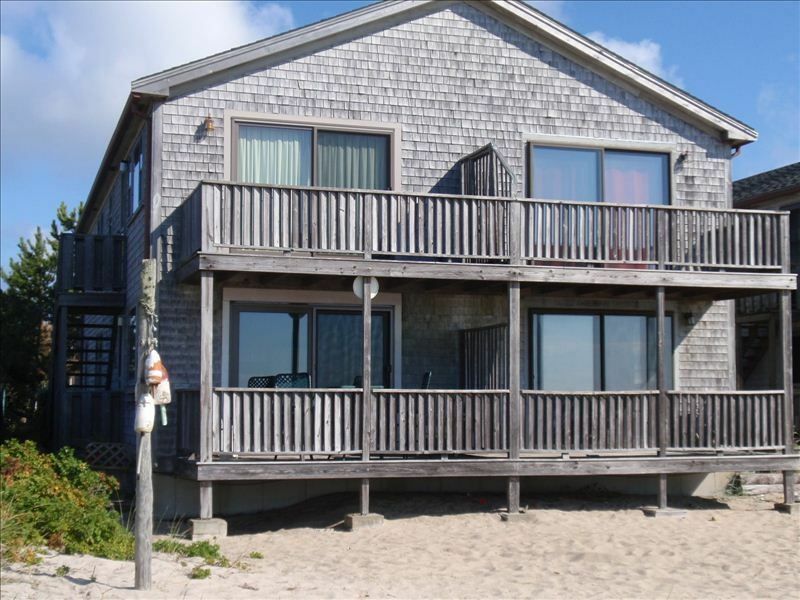 A two bedroom, one bath Condo located in a four-unit beachfront building in Oceanside Condominium on Route 6A (945 Commercial St) in P-town. Shuttle bus to town stops anywhere along rte 6A, or ride your bike into town (1.5 mi to the center of P-Town). There is a queen-size bed and ceiling fan in the master bedroom, and two double beds in the second bedroom - all decorated with pretty summer quilts. Kitchen, living room, dining area have fabulous views of the bay and sunsets over P-town. Sliders open onto a shaded deck for times when the beach is too sunny or for ferry-watching with your morning cup of coffee. Fully-equipped kitchen with microwave and dishwasher. New Andersen windows throughout. Also a flat panel TV, DVD, and extended basic cable (yes, you get the Red Sox). Wifi is available in our unit. Renters must bring their own bed linens and towels. There is a place in Wellfleet that will rent linens and towels for anyone not able to bring their own. Local phone service is provided; a phone card or cell phone is required for long-distance calls. Coin operated washer and dryer in building next door. Going into P-Town? The Cape Cod Regional Transit Authority provides shuttle service every 30 minutes from 7:00am to 12:45am daily beginning mid-June. Passengers may board the shuttle at any of the scheduled stops or they may flag the bus down anywhere along the route. The ride from Oceanside Condo into the center of P-Town is about 10-15 minutes depending on stops. The unit is rented on a weekly basis, from Saturday 4 pm check-in (possibly earlier) to Saturday 11 am check-out. Maximum of four persons, no pets, no smoking. Major renovation in 2012 - new sofas, kitchen cabinets, all appliances and floor. My wife and I bought the condo in 1983. Our children are grown now but they used to love to play in the sand in front of our deck. The wonderful beach and bay view from our deck is hard to beat. We have not tired of it in 35 years. Available in building next door. Spectacle view from a very pleasant place! The property was just as advertised. Very clean and well-maintained. The owner was extremely helpful and thoughtful. The view from the deck was spectacular. The neighbors were a bit too close for my taste, but that comes with the type of property. Overall, a wonderful week! We have enjoyed the condo and the view from the deck for over 35 years. We're glad you had a nice week. This is a lovely unit. It is true beachfront and very tastefully updated. The perfect location to bike into PTown (and Head of the Meadow). We will be coming back! Thanks, Ben, for the nice comment. We are glad you enjoyed our condo for the first time and we will look forward to a possible return next year. This was our 3rd time spending a week at this condo, we love it and the location so much that we keep coming back every year. Myself, my wife and our 2 kids love the location and the accommodations. It's great being able to walk right out the door and down to the beach on the bay side or just relax on the porch whenever we want. Its a quick run into to town for lunch and dinner, or a quick trip to the local Stop and Shop if we feel like eating in. Lots of great things to see and do nearby, from whale watching and dune tours, to walking around town or going to the beaches on the ocean side of the Cape (more than a few within a 10 minute drive). My husband, 3 year old daughter, and I spent a week here at the end of July. The condo was spotlessly clean and exactly as pictured. Gerry was super easy to communicate with as we had never rented a condo in this fashion before. He helped walk us through the process. The location is amazing-about 5 minutes to P-Town. We drove our car here from the Toronto area and drove into town most days to eat or explore. There is lots of parking in central P-Town and we never had a problem finding a spot there or at the condo. In front of the condo is a great beach just over the dunes. Our daughter loved swimming there and collecting shells at both low and high tide. She also enjoyed watching all the kites flown and visiting the nearby oyster farm. There is a square of sand directly in front of the condo that would also make a good play area for kids. We also enjoyed sitting on the deck enjoying coffee, meals, or just the view. A very comfortable spot that we would recommend to everyone. My family just had the most lovely week here. The condo is very comfortable, offering all the amenities of home necessary for a weeks stay at the beach. Opening up the slider out to the deck every morning and seeing the beach and getting a delightful breeze off the bay just made our week spectacular. Our children (ages 5 and 3) loved playing on the beach every day, playing in the water and exploring the sand bars at low tide. The location is close enough to downtown to be just a quick ride in to go out to eat and walk around or go to the local grocery store, yet also far enough away to make it very pleasant and and allow us to be able to get away from it all. Loved it! This condo is very comfortable without being overly fancy. You can relax on the comfy couches, with the sliders open to the fresh breeze that comes off the bay, or step onto the sand to enjoy the serene outdoors. Walk down the sandy path to experience the sunrise or sunset. Small details like a small mirror strategically placed above the counter so that you can enjoy the beautiful view, even while at the sink! The location is so convenient, whether you drive or take the shuttle into town. All you need to bring are your linens and towels, and hair dryer, then a short drive to the grocery store for the essentials, and you are set for the week. The owner was very helpful with any questions we had, and Joan made it very easy for us to get settled on the first day. You will love your time here! There will be a $300 refundable security deposit. Minimum rental is 7 nights.